Kazakhstan’s national carrier Air Astana has signed a contract for five new re-engined Embraer E190-E2 narrowbodies. Deliveries are scheduled to begin in the fall of 2018, the airline announced. CEO Peter Foster explained earlier that the fleet renewal is expected to increase the carrier’s yields on short-haul flights. 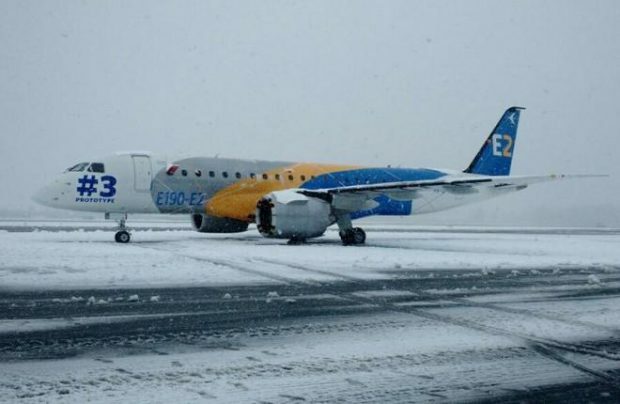 “The new Embraer E190-E2s, along with the Airbus A320neos which are being delivered to us, are cutting-edge aircraft with a low fuel burn. All the measures we are taking will facilitate further growth of our business efficiency and improvements to our product,” Foster said. Air Astana currently operates previous-generation E190s, which seat 97 passengers. The new -E2, which is to enter the market in the first half of next year, will have a seating capacity of between 88 and 106. The new aircraft will replace the airline’s E190s, whose lease term expires in 2019. The carrier was also considering the Airbus A319neo and the Bombardier CSSeries as replacement options. Foster said earlier that the A319 was in fact the most plausible option, since Air Astana had already placed a firm order for 11 larger aircraft of the family: A320neos, A321neos, and A321neo LRs. The airline currently operates 31 Western-built aircraft, including Boeing 767-300ERs, 757-200s, A320s, and A320neos. It also has three Boeing 787-8s on order. In the first half of this year the carrier reported a 12% year-on-year traffic increase to 1.894 million passengers. Of this number, 1.007 million traveled within Kazakhstan (up 4%), and the remaining 887,000 traveled internationally (up 22%). The airline’s transit traffic surged 62%. In the next 10 years Air Astana expects its traffic to reach 9 million passengers, including through consistent growth in the share of transit passengers, which should reach 3 to 4 million passengers per year. The airline reported a 3% decrease in traffic for 2016, to 3.74 million passengers. The Eurasian Economic Union and Latin America: What could 2018 Bring?